What does it mean for Telecommunication? With mobile broadband usage at an all-time high – and still growing – most communication service providers (CSPs) need help in harnessing the right data to improve operational efficiency, serve customers better and ultimately increase revenue. 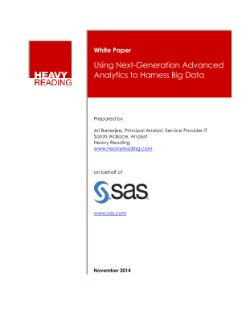 Heavy Reading surveyed 69 global operators, exploring their perceptions, involvement and future plans regarding big data and advanced analytics. The results show why CSPs should use advanced analytics from proven vendors to develop a streamlined approach to capturing real-time intelligence from all their big data. Profit from data that used to just sit there. More effective pricing and revenue optimisation strategies for individual products or bundles. A healthier, more profitable bottom line.